It’s Day 240 of “365 Things to do in Cincinnati” and today I went out to Market Wines for a wine tasting. 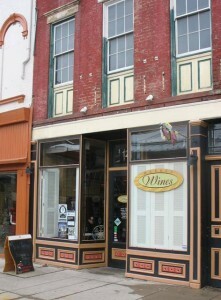 Market Wines is a full service wine shop located at Findlay Market. 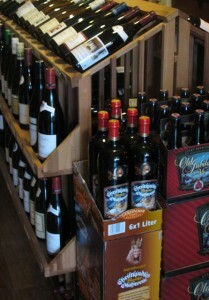 The shop stocks 500 wines plus all kinds of wine accessories, glasses and they . 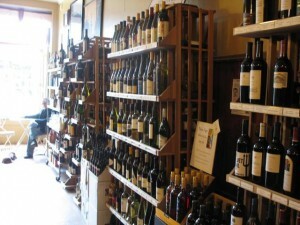 This was my first visit to Market Wines. I met up with some girlfriends there for their weekly wine tastings. For just $5 we enjoyed four different wines. Today’s selection was a white from southern Italy followed by three different reds – a Pinot Noir, a Grenache/Merlot blend, and then a Cabernet Sauvignon. As you can see, they draw quite a crowd. 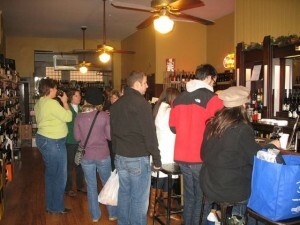 Market Wines has tastings every weekend and will also do a private tasting (call ahead for details). I met some friends there and we just stood around and chatted while we enjoyed our vino. The atmosphere was great as were the friends :). The tasting was just $5 a person which we all thought was a great bargain. They also have a cheese plate to snack on for just $5. 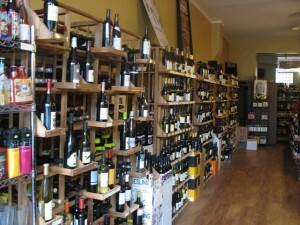 They have lots of wine to choose from and they also have a selection of unique beers. I ended up taking home some “Angry Elf” beer for Christmas. It’s a honey and cherry ale. Sounds like something fun to serve for Christmas, huh? We had a great time and enjoyed our wine tasting. I will definitely go back and highly recommend that you try them out too! What a great time, I can’t wait to go back. It makes me wonder what I have missed the last 19 years!